Aerial fire ladder trucks are used in some of the most dangerous situations, so you need one that you can count on. Each fire ladder truck is designed and manufactured by Pierce’s team that is committed to safety and performance. Pierce offers a variety of configurations for their fire ladder trucks, including the exclusive Ascendant® aerials. The Ascendant® class of aerial fire ladder truck is a revolutionary new design of aerial device construction. Pierce is the only fire ladder truck that can put a heavy duty 100’+ aerial device on a single axle. Interested in learning more about Pierce Fire Trucks? Contact us to discuss! 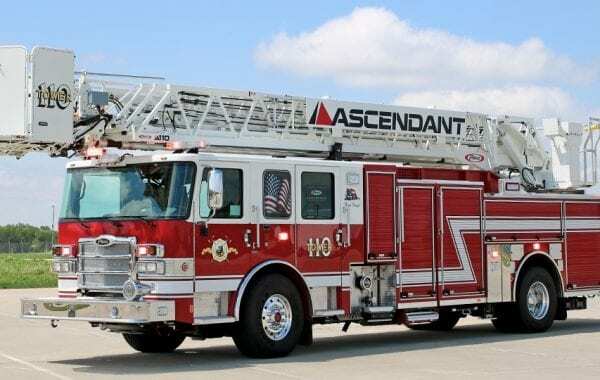 The Ascendant® 100 Tower fire ladder truck features a 100’ vertical and 93’ horizontal reach, 1,000-pound tip load, 2,000-gpm flow, six stabilizers with integrated ground pads, -20*-77* operational range, and a four-person platform basket. This fire ladder truck has superior maneuverability with a low ride height of 10’8” and a short overall length of only 41’3”. This truck also has a superior scrub area of 50* and 20’ setback allows this fire ladder truck to be set up in just 28’ of roadway. 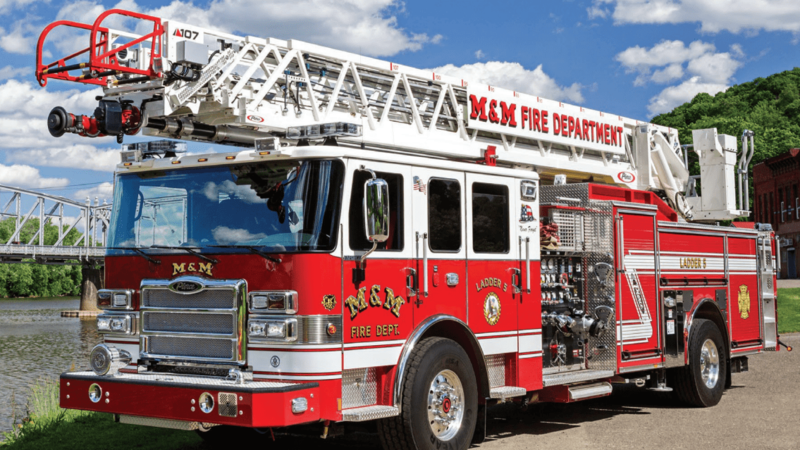 This fire ladder truck is available on a variety of custom chassis and body styles to meet the needs of any department. 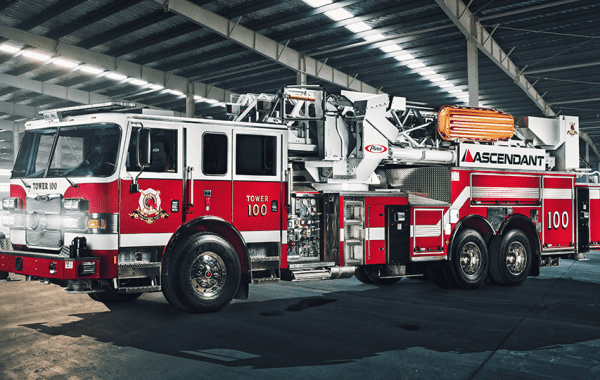 The Ascendant® 110 Platform fire ladder truck features a 110’ vertical and 90’ horizontal reach, 750-pound wet tip load, 1,250 gpm flow, short-jacking capability, and -10* – 77* operational range. It includes a 100,000-psi high-strength steel ladder and a 3-person platform basket. This fire truck ladder includes one set of H-style stabilizers. The Ascendant®107 Fire Ladder Truck features a 107’ vertical and 100’ horizontal reach, 750-pound dry tip-load, 2,000 gpm pump with 1,500 gpm tip flow, and below grade response. This fire ladder truck also features a 500-pound wet tip load, replaceable egress, -10* – 77* operational range, and smoother and quicker deployment speeds. The Ascendant®107 Fire Ladder Truck on a tandem axle reduces the setup footprint, featuring 2 H-Style outriggers and 2 downriggers. This fire ladder truck has a rear axle rating of 44,000 pounds for less brake and tire wear. It features shorter stopping distances and better chassis drivetrain performance. The Ascendant®107 Tiller provides improved maneuverability and setup capabilities. This fire ladder truck has a weight that is reduced by 4,000 pounds, allowing for more flexibility with configurations. When you purchase a Pierce fire ladder truck, you can count on them to provide superior customer service one-hundred percent of the time. You’ll never get the run-around because Pierce makes every component of your fire ladder truck – no exceptions.